How to Clean a Guitar Amplifier. Cleaning guitar amplifiers is easy because they usually have open backs with a vinyl type of covering. 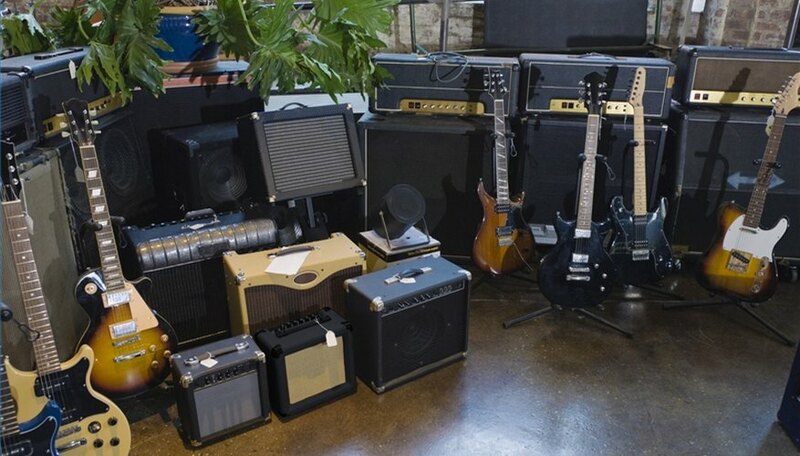 Closed back cabinets with "fuzzy" or carpet style coverings tend to be bass amplifiers. Cleaning guitar amplifier jacks and pots regularly will help prevent certain failures, while cleaning guitar amplifier exterior coverings will help preserve the amplifier's appearance. Power off the amplifier and unplug it. Wait for the amplifier to be completely cooled down before cleaning. Use the hose attachment of a vacuum cleaner to vacuum the inside of the cabinet and back of speakers. Vacuum over any grills or vents in the metal chassis of the amplifier. Clean the outside of the cabinet using a clean cotton rag and spray cleaner. Since any liquid getting into the interior of the amplifier can cause damage, never spray the unit with cleaner. Apply cleaner to the rag and then wipe the exterior of the cabinet. Clean the face of the amplifier with the cotton rag, reapplying cleaner if necessary. If the face is particularly dirty, knobs of the amplifier may need to be removed. Turn all knobs completely to the left. Most knobs can be removed with a firm tug, but some knobs may have a set screw securing them to the potentiometer shaft. These set screws will need to be removed. Clean under the knobs as necessary and replace them so their indicators point to the extreme left position. Rotate each knob from right to left and back quickly 10 to 20 times. This will help clear away any debris inside the potentiometer itself and reduce crackling and drop-outs. Apply contact cleaner to the rag and place a single thickness of the cloth over a three quarter inch female plug. A guitar cord works great for this and it will not damage the plug. Insert and remove the female plug with the cloth over it into every plug in the amplifier, even if they are not normally used. Re-apply cleaner as necessary. If the rag has been stained black or brown, reinsert the cloth until it is clean when removed. Alternately, sponge tipped (not cotton tipped) cleaning swabs may be used. Glass cleaner is great for cleaning the chassis and exterior. Only use contact cleaner to clean the jacks. Do not ever spray any product into an amplifier. Do not use any type of spray oil or lubricant to clean the jacks.